Ann Warner can glide gracefully from the tea table to the boardroom to the media stand, all without breaking a sweat. She can charm the socks off a combatant in one breath and deepen the support of a follower in the next. Ann is a Southerner who cherishes her roots (Georgia and North Carolina) and serves as a proud ambassador for southern hospitality. She has spent the majority of her career in the trenches of the fights for women’s rights, working with grace, aplomb and intelligence. Ann first left the South to attend Wellesley, where she earned a degree in English. After college, she returned to Atlanta and took a fundraising job with AID Atlanta. Seeking a more global platform, she later joined CARE USA, also located in Atlanta. While spending her 25th birthday in Malawi with people suffering tremendously from a drought, the impact of the circumstances of one’s birth struck her hard. She became firmly committed to deploy her intelligence, skills and passion to work alongside women and girls to build a better world. Shifting her career from development to policy, Ann earned dual degrees from Columbia University: a Master of Public Health (MPH), with a concentration in Forced Migration and Health and a Master of International Affairs (MIA), with a concentration in Economic and Political Development. After graduation Ann consulted to and was eventually hired by the International Center for Research on Women (ICRW) which conducts empirical research to advocate for practical ways to empower women and girls around the world. Serving as a special assistant to the CEO Geeta Rao Gupta, Ann learned how to manage a nonprofit, deal with a board, lead teams and make effective decisions. In late 2015 Ann received the opportunity to put the lessons she had learned from Geeta into effect when she accepted an offer to become the CEO of the Women’s Rights and Empowerment Network (WREN), a start-up advocacy organization in Columbia, SC focused on rights for women and girls. She is leading a team of eight which has, as she says, “plenty to do.” WREN’s mission is to advance the health, economic well-being and rights of women, girls and their families in South Carolina. 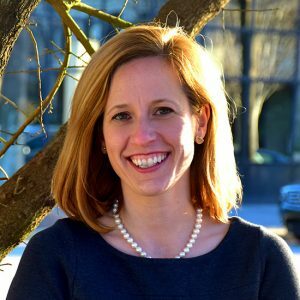 WREN strives to be the voice for South Carolina’s women and girls by advocating for legal and policy changes to enhance the status of women and the well-being of families; educating policymakers and the public; and empowering women, men and young people to speak up and speak out for a better South Carolina. Ann is married to Cody Towles, who is also an internationalist and works for the Millennium Challenge Corporation. They have two sons who are busy exploring their neighborhood on bikes, Big Wheels and knees. I was named after my two great aunts on both sides of my family. I have always been called by my middle name, Ann, which has caused some confusion in my life. My aunt, who also goes by her middle name, encouraged me to embrace this, as I would always be forced to speak up for myself on the first day of school, at jury duty, the doctor’s office, etc. I was an ambitious, if impractical and dreamy, child. An actress, a writer, a zoo keeper, a fashion designer and President were all on the list at various points. What do you want to be now? I am what I want to be! I’m in a place where I can do good work, be creative and work with fantastic people on issues that matter. If you could have a mulligan, what would you do differently? I would have not rushed right into a respectable “desk job” as a young professional. I would have taken more risks, traveled more, tried to get a job or a volunteer gig in a foreign country, language or field. I would have embraced the potential for failure, embarrassment and financial ruin! What are you reading currently? Book or e-reader? I greatly prefer the experience of reading paper books, but sometimes I get too impatient to start something new and buy books on my Kindle. Right now I am reading The Secret Place, by Tana French. How many countries have you visited? To which would you most happily return? Probably around 40. The countries I am most eager to return to are Argentina, India, Thailand and Turkey. What is the biggest challenge ahead of you? Starting up a new nonprofit organization with ambitious goals in a different state. Malala Yousafzai. And my mom. Which superpower would you most like to have? You’re invited to a state dinner at the White House and cannot take your spouse. Who is your date? My dad! He can talk to anyone, and he is an excellent dancer. With what musical group/artist, living or dead, would you most like to perform? The late, great Prince. And second to Prince would be Dolly Parton as I so appreciate their dedication to performance, wardrobe, and HAIR!